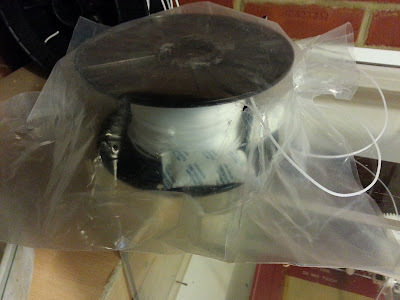 I recently got some experimental grade acetal filament for testing purposes from Stratum3D. Acetal, or Polyoxymethylene is an engineering plastic with the desirable characteristics of high stiffness and a low co-efficient of friction. That low co-efficient of friction is where I think it can have a major impact on what can be produced with fused filament 3D printers such as the RepRaps we use. I have visions of moving parts with integral low friction bushings and other surfaces. It is not as low friction as PTFE but has better wear resistance. The acetal was supplied in 1.75mm filament so the quick change extruder design on the Mendel90 came in handy and I was soon up and printing. As the picture shows I had to experiment with a number of build surfaces; the advantage of this plastic being slippery in use is a disadvantage when trying to get it to stick to anything! The slight blue tinge to the picture is because it is taken through the acrylic enclosure that I added to our prototype Mendel90, acetal degrades if overheated giving off formaldehyde which you don't want to breathe. Kapton tape on glass with and without hairspray. High density cardboard (the stuff used as backing on cheap picture frames and cheap furniture). Extrusion temperature was 225C with varying bed temperatures (these also influenced the temperature of the enclosure). 225C was as hot as I was prepared to go without risking the acetal degrading. Insufficient adhesion at any temperature, everything extruded stuck to the nozzle making a nasty mess. Adhesion at 80C was enough to allow part to build but warping forces rapidly overcame bed adhesion and the part ended up stuck to the nozzle. Lower temperatures than 80 gave insufficient adhesion. Higher temperatures saw the primer adhesion weaken quicker. 3) Kapton tape on glass with and without hairspray (130C). 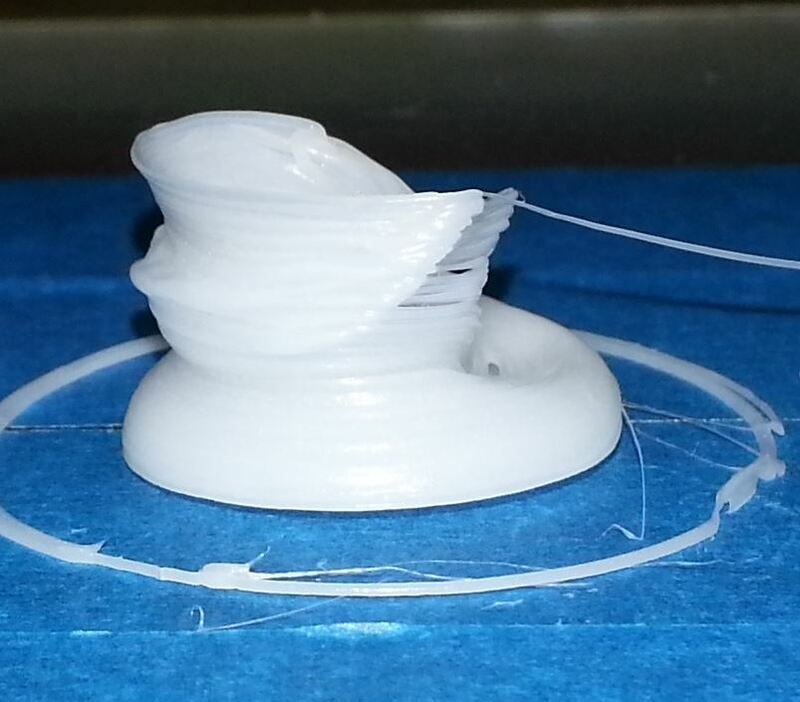 Insufficient adhesion, same as 1, did not try lower temperatures. 4) Masking tape on glass+ hairspray. Sufficient bonding for the object to complete printing. 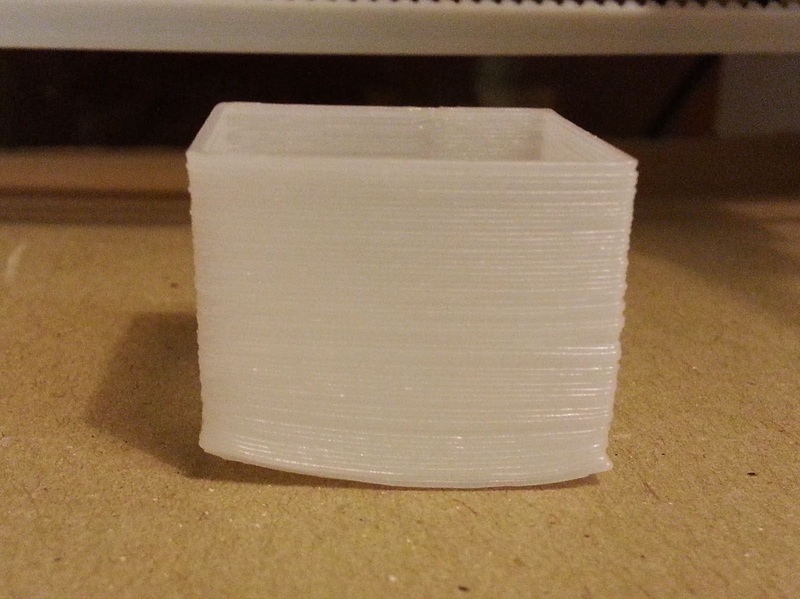 Warping forces caused the edges of the bottom of the object to curl up and the first few layers to be distorted. Higher layers printed better. Inter-layer adhesion is strong. Heated bed was set to 130C for first layer then dropping to room temperature after that. Sufficient bonding for object to remain on bed, sides warped up slightly. Drop in bed temperature and chamber temperature (doors to chamber were opened) cause severe warping and shrinking from the second layer onwards. 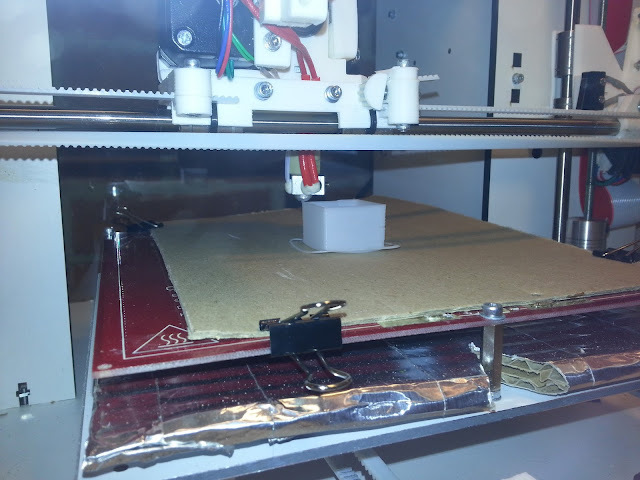 Warping over the first few layers but remained stuck to the cardboard throughout the print. The 200% extrusion gave double thick, very strong walls. Printed object retained cardboard fibres following removal from the bed. 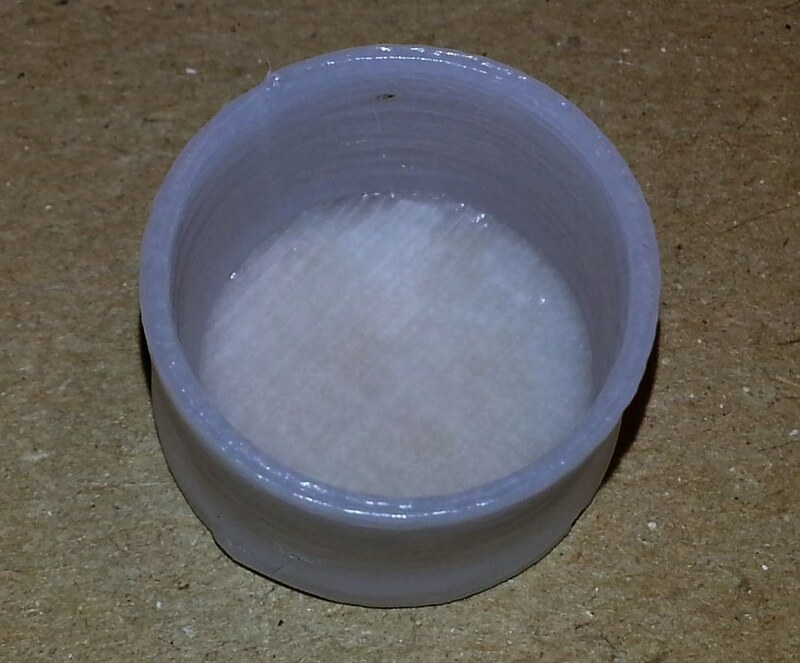 Single wall cylinder, 20mm OD, 0.2mm layer height, heated bed 130C. 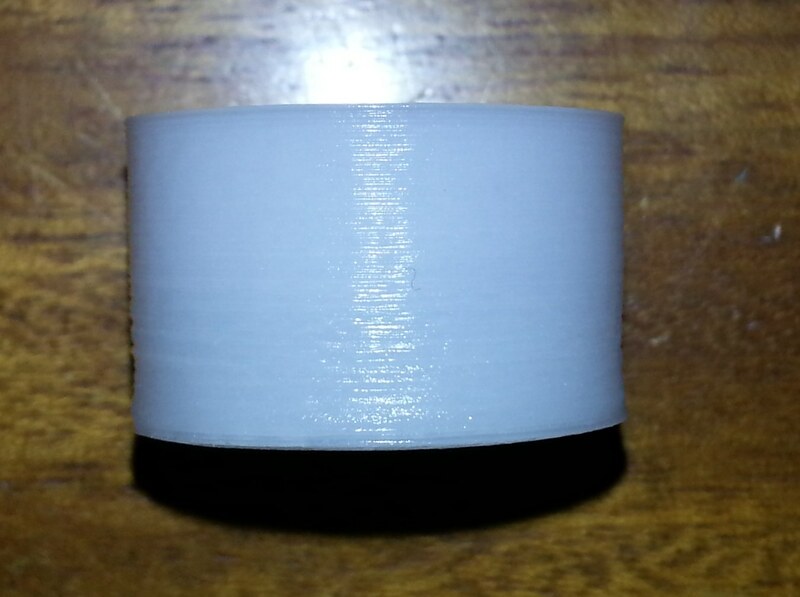 Minimal warping due to leaving the heated chamber for 1 hour to get as hot as possible before printing. Even so the base did lift up around the edges. Excellent layer adhesion achieved. As expected corners of cube warped more than the cylinder but did not rip the cardboard surface up with them. The cardboard stuck to the bottom was from where the object remained fixed to the surface throughout the print. This is probably because the warping began while the just deposited part of the shape was still hot. 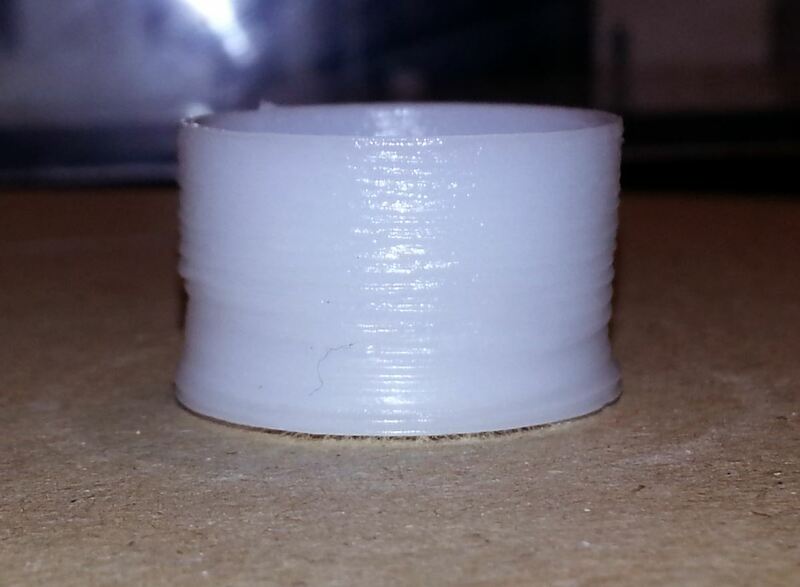 Layer adhesion was less strong possibly due to the increased warping forces due to the lower build chamber temperature. I want to try further build surfaces RichRap recommended Tufnol for nylon so I will try this as it should combine stiffness with "free" fibres like the cardboard. Also Andrew at Stratum3D is looking at the acetal formulation which may make it easier to print with. 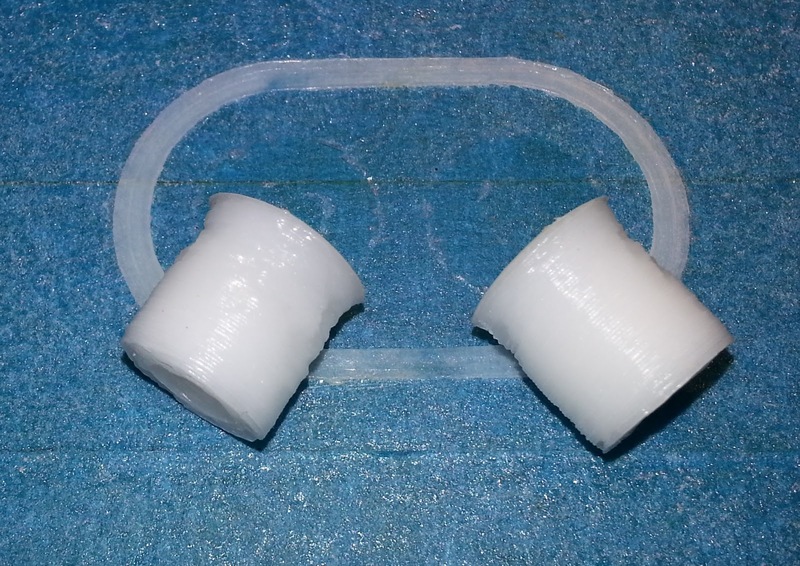 I am going to print some replacement bushings for the lm8uus and install them on one of the prototype printers to do a wear test. Either PropsFactory's design that look like IGUS or Triffid hunter's design. Ultimately incorporating this with ABS, PLA or nylon in a multimaterial print would open up a huge number of possibilities for complex objects. have you ever thought of using vacuum to keep the print fixed? I have not considered it much - vacuums tables are useful for processes like laser cutting fabrics but I think it would add a lot of complexity to this system, and probably not work. That said I am more than happy to be proved wrong! How about printing on Garolite LE, like taulman recommends for his nylon. Your warping looks the same as nylon warping. I have not tried an smooth FR4 panel but I did use the back of stripboard which worked (but that may also have been the holes helping. Stratum ow working on the formulation for their POM so I will test it in more depth when I get some of that. Why not try a sheet of delrin, acetal rather???? Take a 1/4" sheet of acetal and heat it as the bed. 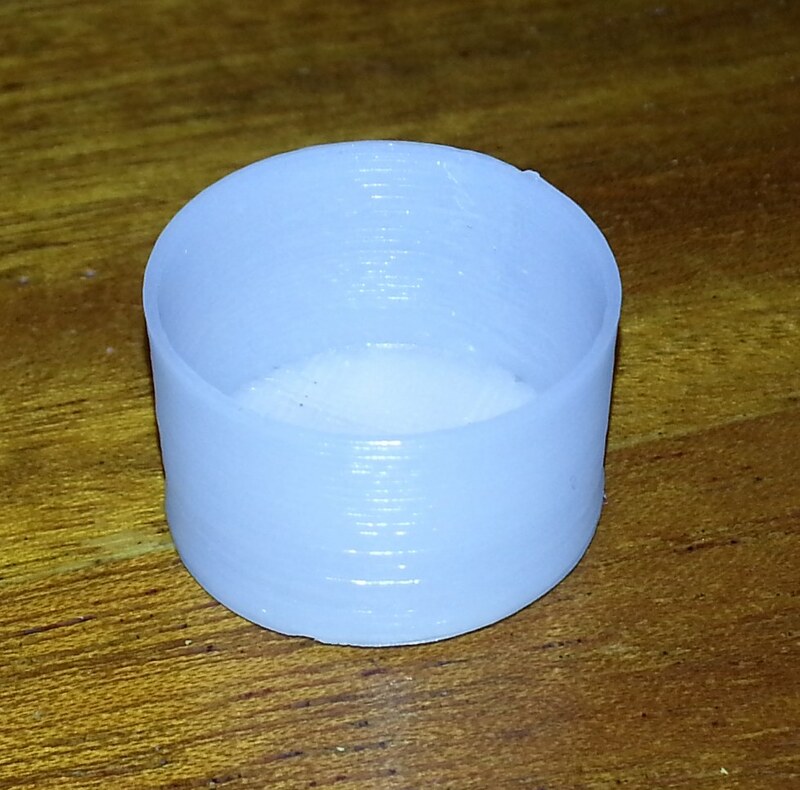 I would think that extruded acetal would stick better to acetal than anything else??? That would be worth a try, let me know if you have any success. Great writeup. Thanks for sharing. People like you make the world a better place. I think the addition of acetal to the 3D printing lineup will open up some interesting possibilities. I am afraid my experiments with Acetal have taken a back seat to many others in the interceding time so i have done no more. A really good idea I heard at last years TCT show (I think from e3d) that could solve these issues with plastics that just don't want to stick is to use a hotend like the e3d Cyclops and a raft. Start by laying down a compatible plastic to Acetal that does stick (maybe ABS?) and then alter the ratio on subsequent layers of the raft until all that is left is the Acetal - then print the acetal part on top of that. Not sure if anyone has tried that yet though! 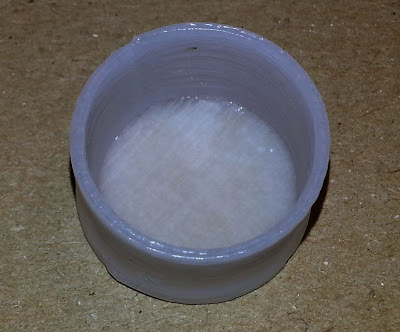 I've been experimenting with Acetal quite I bit for the past few weeks. This is what seems to work the best for me. Extruder temperature is set at 220 C, I'm using an aluminum heated bed with Kapton tape covered with hairspray. The bed temperature is 115 C, I dropped the bed temperature to room temperature after first few layers. I'm using brim as support. print speed at 30%. I'm using a Prusa i3 without an enclosure. I'm having minimal if any warpage. I hope this helps. What brand r u using? All. 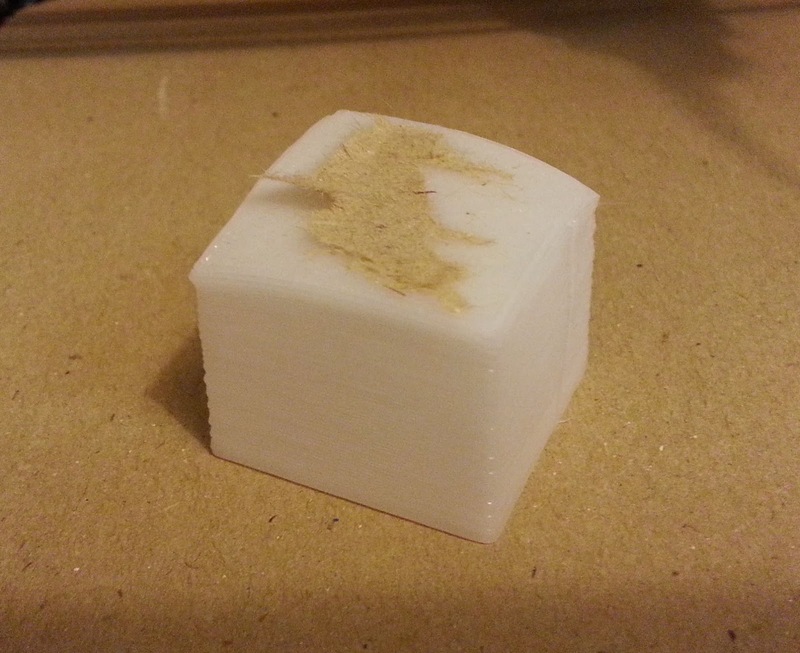 I'm printing POM successfully at 177C on UNTREATED hot bed @ 140C. Not great prints so far, but at least the stuff is sticking and not warping. I have my extrusion and movements set to VERY SLOW however. Makes this less than ideal, but hey it finally works. I've had a heck of a time with Gizmo Dorks POM. Warping is the main issue. I'm able to get it to stick to a LARGE bed of PLA at 50C and below (so the PLA bed remains flat), but laying down the PLA takes awhile and there's still the issue of warping. The only way I can stop the warping is extrude at 177C. If I could I'd heat up the entire chamber @ 150C and try 195C to see of that warps. Can't do it with my gear though.